Welcome to our new digital home. We hope you enjoy exploring this new site — designed to make our 15-year archive more hospitable and accessible. And if you want to stay in touch with our latest podcasts, writings, live events, and more, sign up for The Pause, our Saturday morning newsletter. The Jewish poet since biblical times cannot remain silent. I am a Jewish poet. Elie Wiesel gives permission to speak up and to speak for those who cannot speak. Finally I came upon a possibility. One of my areas of special poetic interest is ekphrastic poetry, a form which takes its inspiration from pictorial and other artwork. Many years ago, I had been privileged to experience “The Precious Legacy” exhibit then touring the United States. It was a selection of artifacts from the remarkable collection of the Jewish Museum in Prague. As it happens Prague is very close to home, my ancestral home, actually. My paternal grandfather came to America from Riga, Latvia in 1886. The exhibition, which toured from 1983 to 1986, gave those who saw it a look at a small part of an extraordinary collection of Judaica. The Museum’s treasures exist due to an ironic twist of fate. From 1942 to 1945, the Nazis confiscated Jewish possessions of artistic and historical value throughout Bohemia and Moravia (the Czech Republic), and whilst Jews of these lands were being deported to captivity and death, these artifacts were shipped to Prague. The Nazis’ intention was to establish a “museum to an extinct race” that would justify to the world the “final solution to the Jewish question.” Prague was spared from wartime destruction, as was the collection of Judaica that by war’s end filled more than 50 warehouses throughout the city. 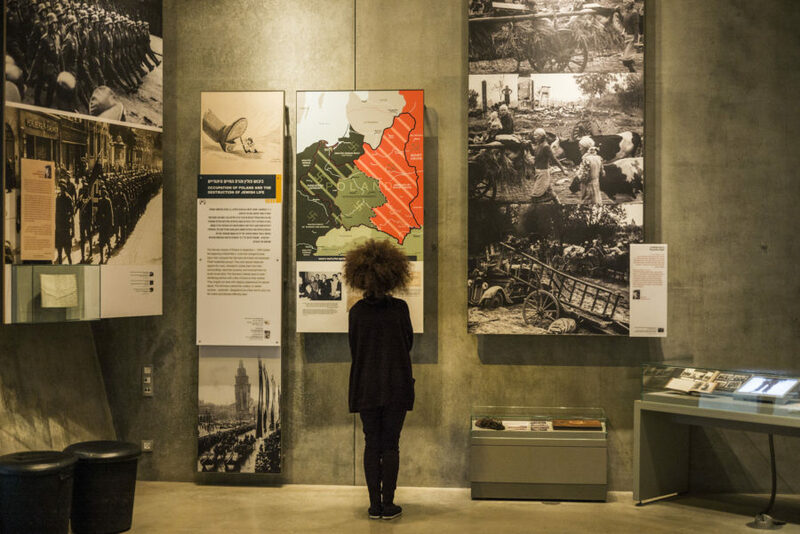 People visit the Yad Vashem museum to commemorate International Holocaust day in Jerusalem. Image by Ilia Yefimovich/Getty Images.. These artifacts were silent witnesses from the time. I could give them a voice, and in this way let them speak for themselves through me — a bold but plausible mission. I contacted Jakub Hauser, the curator of the vast photographic collection of the Jewish Museum, and presented my idea. I asked if the museum would grant permission for me to select and use a number of archival photographs from the collection for a series of poetic statements about them, as well as a selection of extant art and writing of children and adult prisoners, principally of the ghetto-camp at Terezin. The museum agreed. I chose Terezin as the focus of the work, as the camp has become associated with the spiritual resistance of the Shoah. Thirty-three thousand perished at Terezin. In all, some 140,000 Jews were transferred to Terezin, of which nearly 90,000 were ultimately sent to points further east and to almost certain death. Fifteen thousand children passed through Terezin. Approximately 90 percent of these children perished in death camps. Children bring candles to at a Jewish cemetery at the former Terezin Nazi concentration camp during the ceremony to mark the 70th anniversary of the liberation of Auschwitz. Image by Michal Cizek/Agence France-Presse / Getty Images..
On a Sunday — April 9, 2000 to be exact — a windy day with almost a record low and light snow falling in the early morning, the United States Holocaust Memorial Museum held a special day-long program devoted to poetry of the Holocaust. The keynote was delivered by the Nobel laureate and poet Czeslaw Milosz. A Catholic turned atheist returned to Catholicism, he was a member of the resistance in Warsaw during World War II. Eighty-nine at the time, Milosz died four years later in 2004. In an interview after his presentation, Milosz stated that the only credible poetic response to the Holocaust is in writing about anything and everything else, perhaps to assert in this way hope in the promise that there can be life after death in a collective sense. So what of those who dare to “speak” of it? While there are countless poems, there is hardly a work tackling the why and the what of the genre per se. Can there be and should there be Holocaust poetry? Seven lion and lioness literary luminaries joined the fray in a series of seven articles in the Michigan Quarterly Review. Joy Ladin contends that there isn’t, and shouldn’t be, a corpus of poetry of and about the Holocaust, only allowing for the attempt of individual poems. Seeming to agree in a sense with Adorno’s admonition, Ladin maintains it is, prima facie, impossible to do justice to the experience of the Holocaust — that trying to turn the tragedy into an aesthetic piece of poetry is a travesty, that the experience is inexpressible. A photograph of the entrance to the Auschwitz concentration camp taken by Chris Schwarz, from the exhibition "Traces of Memory." Copyright: Galicia Jewish Museum, reprinted with permission. Image by Chris Schwarz/Galicia Jewish Museum.. It is highly unlikely that those who choose to write of and about the Holocaust do so to be considered as heroes. More likely, the purpose is to strike one more match to keep the flame of memory and truth ignited. Photo from the archive, Jewish Museum in Prague, used with permission. after a rail extension direct to Terezin was done. their new destination must be reached without delay. as the onlookers stare; where are they? appealing for those walking by in gloom. Who endured this walk only to meet their doom? We cannot know for certain. Gustav Ziegler—May they rest in peace, and may the human race be forgiven. Names taken from the Central Database of Shoah Victims’ Names, of those who perished in Terezin, 1942 or after, Yad Vashem. high upon the building’s roof. evil, what might have been? dismembering at Auschwitz and Treblinka. Who is on the train destined for their demise? and may the human race be forgiven. Names taken from the Central Database of Shoah Victims’ Names, of those who perished in Terezin, 1943 or after, Yad Vashem. Josef Ernst is the name on the suitcase. What can we know from a suitcase? we can but hope that he forgave the human race. Name and information from database of Terezin Initiative Institute entries for Shoah victims and survivors. “Terezin: Trilogy Of Names” was originally published in China Grove Literary Journal. Quoted matter from Michigan Quarterly Review used with permission. 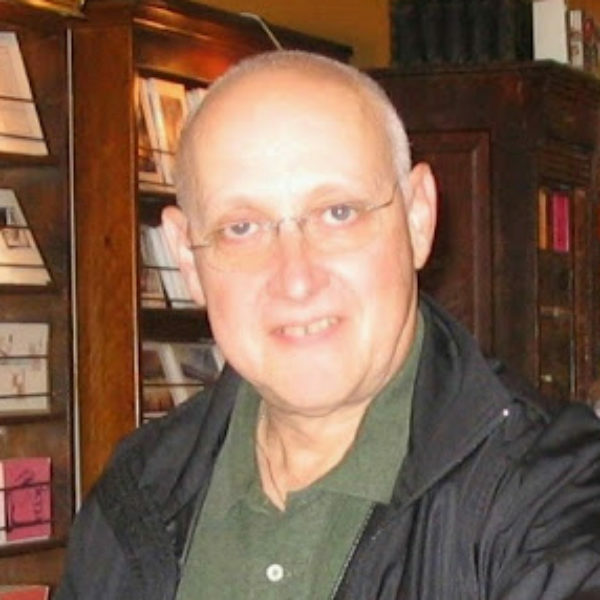 Howard Richard Debs is a poet, writer, photographer, sometime artist, musician, and singer-songwriter. He received a University of Colorado Poetry Prize at age 19. After spending the past 50 years in the field of communications, he resumed his literary pursuits, and his work appears or is forthcoming in The Germ, Calliope, Big River Poetry Review, Jewish Currents, Poetica Magazine, Misfitmagazine, Star 82 Review, The Review Review, Belle Reve Literary Journal, Verse-Virtual, Dialogual, Sediments Literary-Arts Journal, Piecemeal Review, Remarkable Doorways Literary Magazine, Indiana Voice Journal, Blue Bonnet Review, China Grove and Eclectica Magazine. His forthcoming book, co-edited with Matthew E. Silverman, is New Voices from Salvaged Words: An Anthology of Contemporary Holocaust Poetry and Essays. For more of his writing visit his blog Communicators & Communications. Born and bred in Chicago, Howard now lives in sunny South Florida with his wife of 49 years Sheila, where they spend considerable time spoiling their four grandchildren. The On Being Project is located on Dakota land.